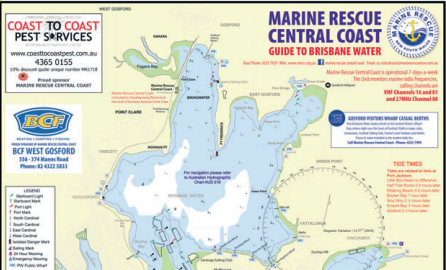 Marine Rescue Central Coast has released an updated four colour map of the local waterway, Brisbane Water. This up-to-date Guide to Brisbane Water is laminated for protection whilst in use on a boat. The map details all the current navigation marks, lights and channels, and in particular, the ocean bar at Little Box Head. 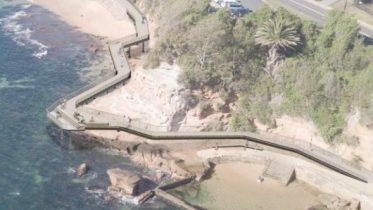 Included are all public launching ramps, public jetties and public mooring locations. It will help recreational boaties and fishermen safely navigate the many tricky channels on and around Brisbane Water. It will assist visitors locate restaurants with docks and it includes all marinas and fuel locations as well as other safety information for those using Brisbane Water. The new map is available from the Marine Rescue Base at the end of Kurrawa Ave, Point Clare (click Here for map), and at many popular boating, bait and fishing shops on the Coast. The Guide is a must for all safety conscious boaties. Unit Commander, Mr Roger Palmer, said: “This map is great value for just five dollars and would make a handy gift item for Father’s Day. “You should buy two, one for home and one for the boat.” All map purchases will help keep Marine Rescue Central Coast afloat. Media release, Aug 18, 2016 Ron Cole, Marine Rescue Central CoastThis up-to-date Guide to Brisbane Water is laminated for protection whilst in use on a boat. The map details all the current navigation marks, lights and channels, and in particular, the ocean bar at Little Box Head. Included are all public launching ramps, public jetties and public mooring locations. It will help recreational boaties and fishermen safely navigate the many tricky channels on and around Brisbane Water. It will assist visitors locate restaurants with docks and it includes all marinas and fuel locations as well as other safety information for those using Brisbane Water. The new map is available from the Marine Rescue Base at the end of Kurrawa Ave, Point Clare, and at many popular boating, bait and fishing shops on the Coast. The Guide is a must for all safety conscious boaties. Unit Commander, Mr Roger Palmer, said: “This map is great value for just five dollars and would make a handy gift item for Father’s Day. “You should buy two, one for home and one for the boat.” All map purchases will help keep Marine Rescue Central Coast afloat.